We apply an innovative approach to the proposal process to make your organisation’s knowledge work for everybody. Our solution is not only focused on providing an optimised proposal document creation platform. It's also a sales tool, to help sell your teams' expertise. Our master data approach manages and organises the skills and experience of all your individuals and different projects. By doing this, CV Partner gives you a coherent overview of the knowledge of your entire enterprise. It puts individual accomplishments into the context of collaborative knowledge. The result is a faster, more efficient bid process and more elegant, highly professional finished documents. Our product features put you in control of building your knowledge database, to best meet the real-world challenges of selling knowledge-based services and skills. Replace multiple workflows across different departments with one system. Combine HR, sales and consultants or project teams, with one streamlined process for creating bids or responding to RFPs, RFIs or RFQs. Manage all your skills and roles in just one Master CV. The Master CV contains a complete record and description of all your individual skills and experiences. The data contained in your Master CV can now be used as the building blocks to quickly and and painlessly build new CVs. Simply select the relevant skills and experience from your Master CV and push them into the new proposal. Our unique CV management solution - with only one place for individuals to update and maintain - is fast and pleasingly simple. This leads to more complete and updated CVs throughout your company. Win over prospective clients by showcasing the value you have delivered on previous projects. Use our tool to build Reference Projects to more clearly sell your previous achievements. A Reference Project offers detailed insight into how your organisation has previously solved clients’ challenges. Search and add relevant Reference Projects to new proposals at the click of a button. Use templates to quickly format how you present the knowledge and experience in your organisation. 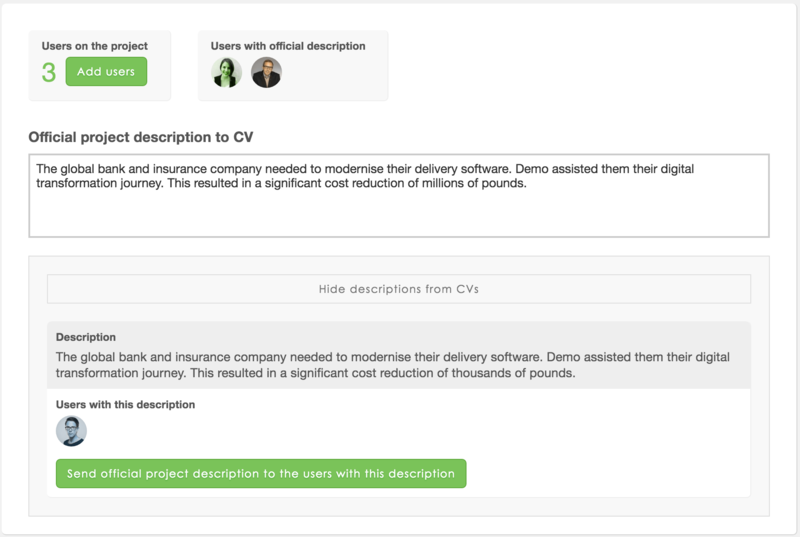 Then, create bespoke documents in minutes for each project or CV. Copy Master CVs and Reference Projects; but extract only the information relevant to the current proposal. Include or exclude fields to effortlessly build a tailored proposal for each project. Stop waiting for your employees to update their CVs. 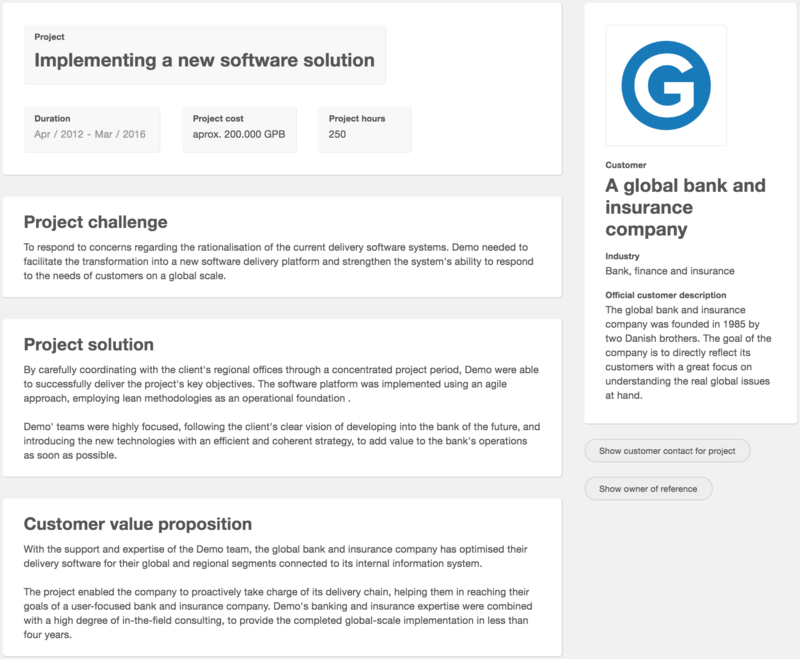 Create a project and write a master description that is pushed directly to each project team members' Master CV with one step. The result is more regularly updated CVs, higher quality descriptions, and individual CVs more consistent with organisational communications and objectives. Team members benefit from a simplified system which requires less time for updating their CVs. Our master data approach means greater consistency across your data. 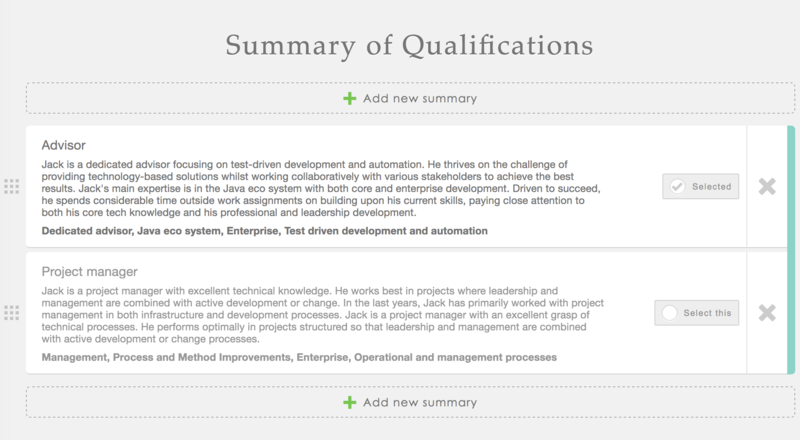 Project details and categories can be predefined in your Master CV for consistent data. Easily alter data errors such as misspellings, or rename categories and fields, across multiple CVs and Reference Projects with one secure functionality.  Proposal templates can be tailored to produce formats incorporating your company branding, and across your organisation, regardless of language, location or department. A single platform for your enterprise provides a consistent user experience for all stakeholders involved in your bidding processes. Our flexible search function allows you to arrange and search for your data in a way that best suits your needs. Create relevant fixed categories to arrange your data; or use free-text search for broad searches across your database. Alternatively, combine the two functions for highly intuitive search actions and results. Each organisation is different and every proposal is different. So we have developed a system that can adapt to your specific needs. Add or change access permissions to control which functions each user can perform. 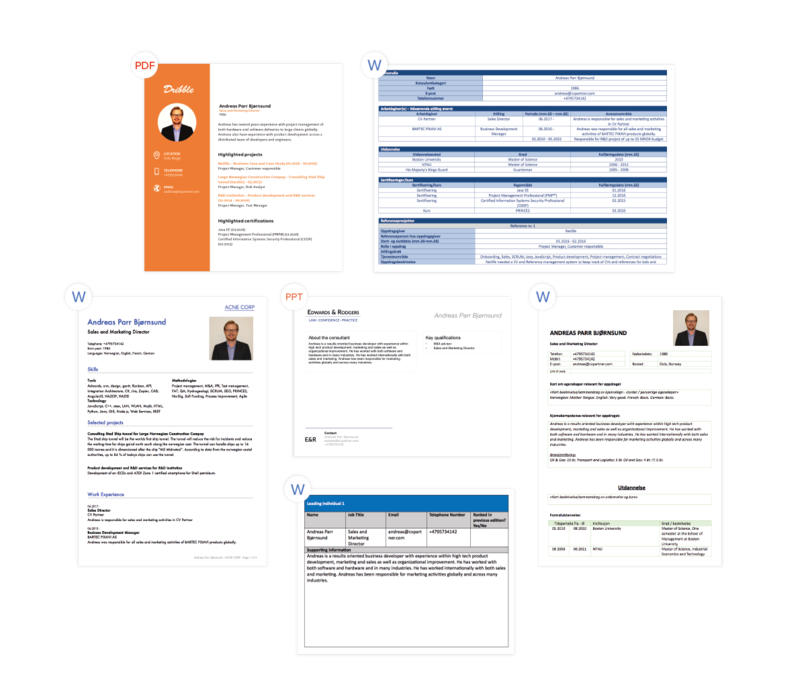 Design CV and Reference Project templates to match client expectations for each individual project. And then export the finished proposal to a Word or PDF format for total flexibility. A powerful, secure and highly effective tool; yet surprisingly simple to implement and easy to maintain. Multiple stakeholders can contribute regardless of location or platform. A highly flexible tool to meet the needs of modern enterprises and their teams straight out-of-the-box. 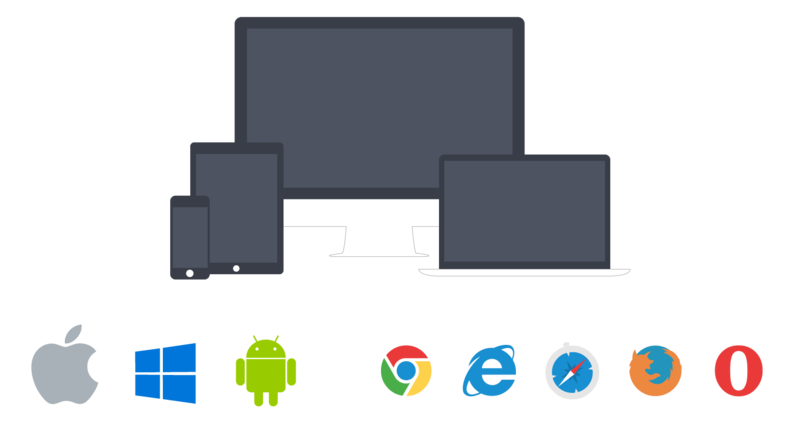 Use our API to build custom integrations and connect the systems you company relies on. Start enjoying the benefits of CV Partner today. Whether you start from scratch or need to migrate from a legacy solution we will guide you through a step-by-step implementation process adapted to your specific needs and company size. Features and SolutionsOne Single WorkflowMaster CVs - One Place To UpdateReference ProjectsBespoke Proposals. Every time.Validated Project DescriptionsConsistency & Data QualityUnique Search FunctionalityFlexibilityCloud-Based Solution - all platformsGet started!